Conductor Anthony Trecek-King led a rehearsal of the Boston Children&apos;s Choir. What would a better Boston look like to you? That was the question one nonprofit decided to ask youth leaders with the Boston Children’s Chorus and downtown professionals. Some of the youngest members of the chorus wanted a city where nobody fought or argued. The older ones said “a better Boston would be cleaner and greener, with better roads and friendlier drivers.” All answers had a common thread: They wanted a city where people were united and where there was less violence. This ongoing volunteer project was sponsored by the organization Building Impact and created as a way to start conversations on race and social justice across the city’s various ZIP codes. The chorus has students from schools across the state. 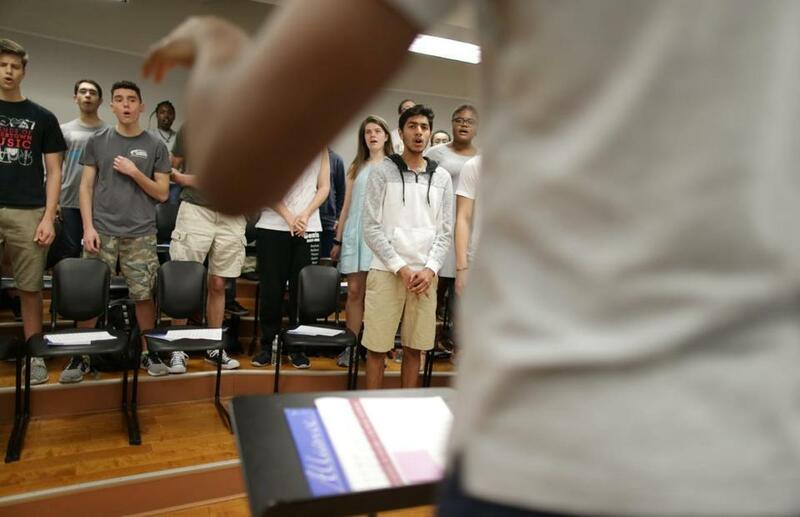 Project organizers are planning to reach 500 corporate volunteers at dozens of companies downtown and have them exchange ideas by writing to hundreds of youth leaders in the chorus. For a race and social justice project, kids with the Boston Children's Chorus exchanged ideas and wrote letters to corporate professionals on how to build a better Boston. 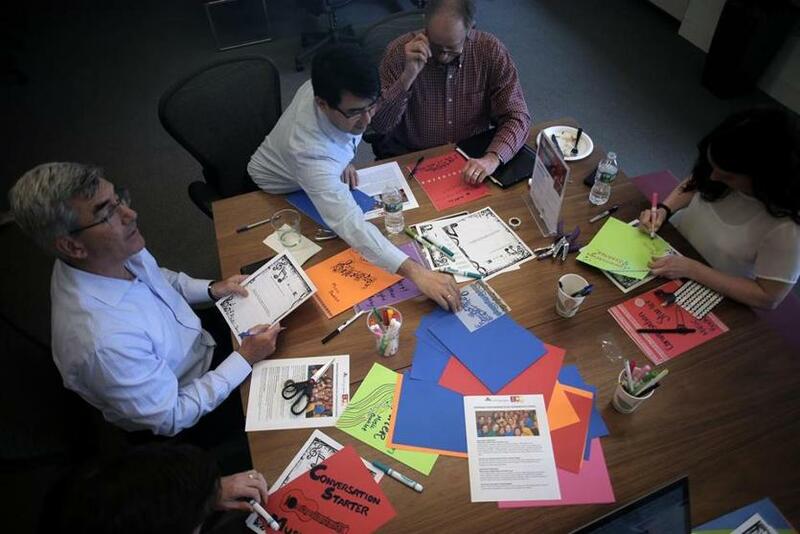 Employees at JLL, a commercial real estate company, worked on their music booklets. The effort began with a questionnaire. The kids in the Children’s Chorus filled it out, and organizers brought the answers to corporate participants. The adults read the kids’ reflections and took the time to respond in kind on music booklets they decorated to be delivered to the young people that afternoon. “More affordable housing to keep families in Boston rather than fast-tracking luxury condo developments,” one wrote. “Give a daily compliment to a family, friend, or stranger in your community,” another wrote. They wrote inspiring quotes on the booklets such as, “Music is the universal language of mankind,” from Henry Wadsworth Longfellow. Many of the adults said they were moved by the young people’s answers. “I think it’s an amazing project to have children as young as 7 start thinking about how their voice can change Boston and that they’re not just another person on this planet, but someone who can enact change,” said Erin Gange, 27, of Brookline, a marketing associate at JLL. Some of the chorus’s advanced singers received the booklets at their rehearsal. There, the conversation continued, led by BCC president and artistic director Anthony Trecek-King. 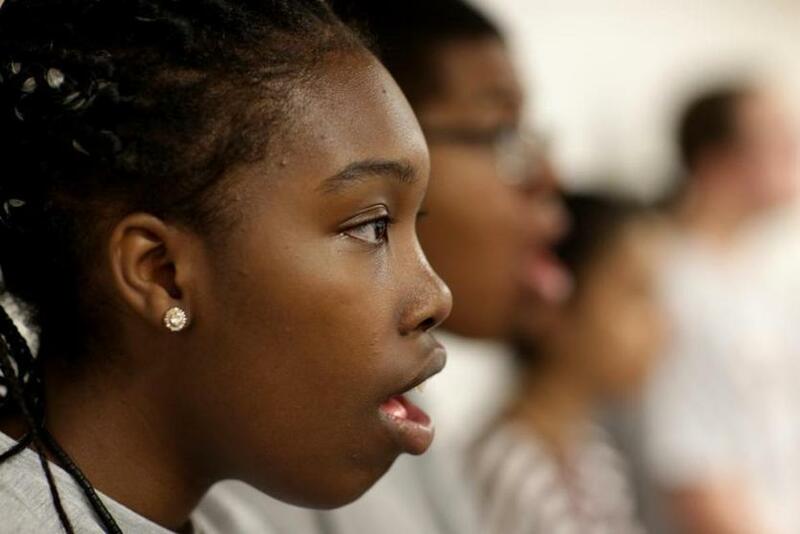 Ma T'arra Smith at a Boston Children's Choir rehearsal. They spoke about the differences among their communities. Some hailed from Chelsea, others from Milton, and they touched on Boston’s complex reputation nationwide. But there was also a lot of hope that ongoing conversations like these would encourage change.